The rain and overcast sky made me want to have something simmering on the stove all day. Specifically, I wanted a stew. With lots of potatoes and carrots. But Michael asked for me to find a Dominican Stew. And I figured when in Miami, Latin American it is. ðŸ˜‰Â Plus this made Michael more willing to go to the store. Which was important, since as I’ve said, unshowered and clad in pajamas. And wanting to stay that way. Thankfully Pinterest has everything. I found a recipe put out by Goya that looked good – and while it didn’t have potatoes or carrots in it, it did have plenty of other root vegetables. But it also had a broth that you need to make from scratch using pork bones. No thank you. So then I found another recipe that used beef broth, but you had to add all these other ingredients and take extra stepsÂ since it didn’t make use of Goya products. I just wanted to smell a yummy stew simmering on my stove all day. I did not actually want to BE AT my stove all day. 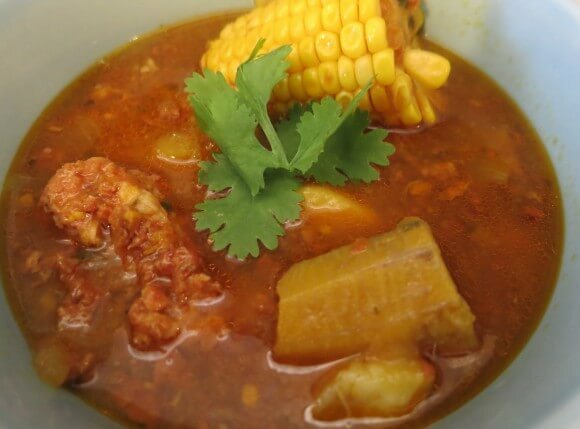 So I decided to stick mainlyÂ to the Goya recipe, but to use theÂ beef broth and include the cilantro and tomatoes that the second recipe mentioned. Because, hello, cilantro. I also added chorizo, because the husband asked, and he is the authority on Dominican Stews, as he regularly orders it for lunch at a couple different restaurants near his office. The chorizo was a good call. It was crumbled and browned, so it infused the broth with a meatier flavor. Plus you got some in pretty much every bite, which increased the flavor of all the root vegetables. And the root vegetables were great. 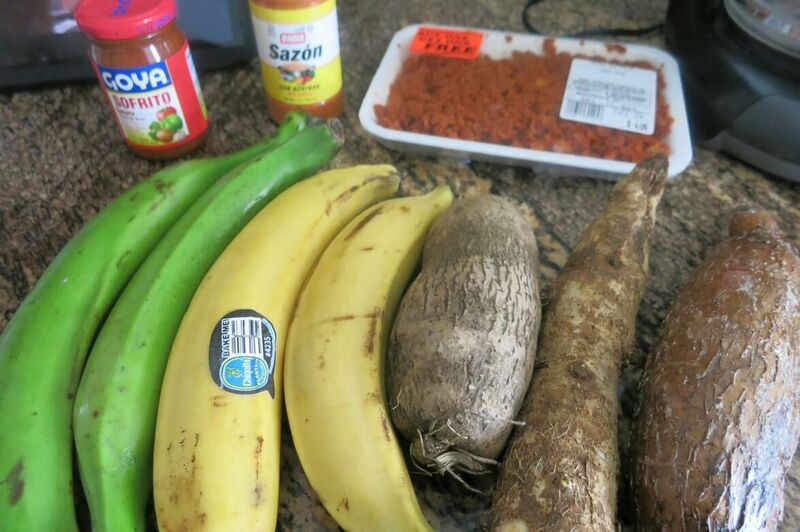 Sweet potato, yucca, malanga, plantains, yam. Since I am in Miami and Michael went to Presidente we could find all of these. If you canâ€™t find, just mix and match with what you have access to. I am so glad we didn’t get the hurricane, but I am also so glad we had a rainy day. 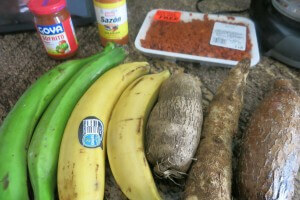 4 yucca, name (yam), malangas, white sweet potatoes and/or butternut squash. Peel and chop. In large pot, heat oil. Add pork, chorizo and onion. Brown the pork and chorizo, and soften the onion, around five minutes. Add sofrito, sazon con azafran, tomatoes, cilantro and 2 cups of beef broth. 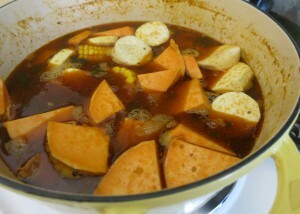 Bring to boil, and let simmer for around 20 minutes, reducing the liquid a little. Add corn and green plantain (if using) and remaining 6 cups of broth. Cook for 30 minutes. Add remaining root vegetables. Let simmer approximately one hour, until vegetables are soft.